Lean Thinking: How to Measure Lean? One question I get asked by most organizations I deal with is – How do you measure a Lean Implementation? The background usually goes like this; management is funding a Lean Transformation and wants to ensure they get a return on their investment. They know how much the cost side of the equation is and so management wants to know how much they are saving. They can then decide whether to continue or not based on the numbers they get. I can manage the business by the numbers so give me some numbers. A Lean Transformation can be reduced to a set of financial results. The next step usually involves setting up elaborate systems to track savings, both bottom line savings and avoided costs or soft savings. This leads to the ensuing arguments of Inventory savings vs. expense savings and Capital vs. partial head count avoided all of which lead to huge savings but as one frustrated company President I talked to said “At the end of the year my pockets are still empty, nothing is hitting the bottom line”. What people forget is that Lean fundamentally is a growth strategy that goes like this. If we take waste out of the process and provide more value to our customers, we will sell more and be able to use the additional volume to fill in the unused capacity we have generated through the waste reductions. It’s a benevolent cycle based on providing more value to Customers. If we are only measuring savings, we only see part of the equation. As organizations realize this, they typically move onto measuring the lean implementation as an in-process measure. Usually, the measure is some form of radar chart with the radar representing various tools, often up to 30 different tools, on a 1-5 scale. This forces operational units to implement tools based on the scoring system whether they need to or not. The problem with this approach is tools are easy to measure but they don’t measure thinking and Lean is based on thinking according to the scientific method. So, what’s the best way to measure lean? For an in-process measure I like to use the Lead time of a process, the sum of all the value added and non-value added steps in a process. Taking waste out reduces the lead time. Lead time then becomes a good proxy for how lean a process is. For an end of pipe measure I don’t use any special measures. I look at Safety, Quality, Delivery, Cost and if the organization is meeting its targets and is meeting them by using Lean in the execution of their plans, then they’re doing fine. Of course, this is confirmed by Going to Gemba and checking. 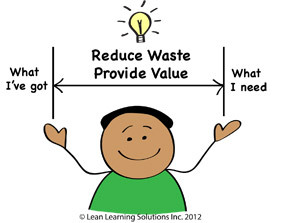 My bottom line - use Lean to close a gap in a business need by engaging people to reduce waste and provide more value to Customers. Measure the value proposition; you can’t go wrong starting with the Customer. Measures are tricky, I don't think there are easy answers (no check list of measure these 8 things...). Just mentioning in-process measures puts this well ahead of much of what is said on the topic of measurement. I think you need a variety of in-process and outcome measures. And these measures should be re-evaluated by those working with them (do they still provide the insight they did when we started using them, are they useful...). Absolutely. Use in-process measures with a fast PDCA cycle so people can see the results of their improvement work quickly and can adjust as required. End of pipe measures whuile key to the business have longer PDCA cycles and are hard to move since there are so many variables involved.